Contractors and the version on the right is for Facilities. Watch the video to learn all the benefits! "Thank you, Gary, your course has been a great learning tool. Customer service is great. You have a lot of respect at UC Davis. 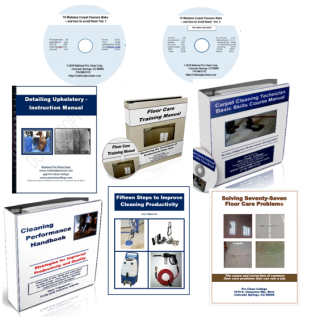 Two-part video series entitled "70 Mistakes Carpet Cleaners Make"
Hard copies mailed to you in the U.S. I believe Gary is one of the top experts on making money in the cleaning business. After learning his techniques on carpet cleaning, pricing and sales, I went out my first day and earned over $500 for one day’s work. I strongly recommend you go with his training program. You will have your investment back in a few days. Your course work and overview of the cleaning business can take a novice and turn them into a veteran, able to compete with the very best in record time. I recently spent nearly $20,000 with a Florida based franchiser, not counting royalty fees or the $5,000 to break my contract before I went out on my own. I could have saved all of this had I known about you earlier. Your comprehensive course is a very valuable tool and I highly recommend it. In just 90 days I have built a full-time income. Since there are no royalties or commissions, the entire profit is mine. You will know in advance the types of questions customers ask. With the right training you will be able to answer the way successful contractors respond. Gary Clipperton truly is an expert in every phase of cleaning and his program will get you started to enjoy a profitable income in your own business. By having the videos, slide shows and manuals and your phone consulting available, it gave me the confidence to step out on my own. Your program covers all aspects of my business including: attitudes, approach, bidding and real life examples, production techniques and short-cuts etc. Here is my belief: A person cannot go wrong by investing in your training program. Your success system works for me. Your program gave me the knowledge and confidence to start my business successfully and I highly recommend it to anyone interested in starting a cleaning service. There is no trial and error, the necessary forms and bidding information are included to give your business and the professional appearance and expertise that your future customers are looking for. All with no franchise fee or monthly royalty. The program works and is well worth the investment.